Home // Biblical Principles // A Chapter a Day! We are reading the Word together at Ingleside – a chapter a day! Have you joined us yet? Today’s reading is 1 Corinthians chapter 15. Tomorrow we finish up 1 Corinthians by reading chapter 16, and then on Saturday, we read 2 Corinthians chapter 1. God uses a daily diet of reading and meditating on the Scripture to give us wisdom and discernment about how to live in ways that please him. 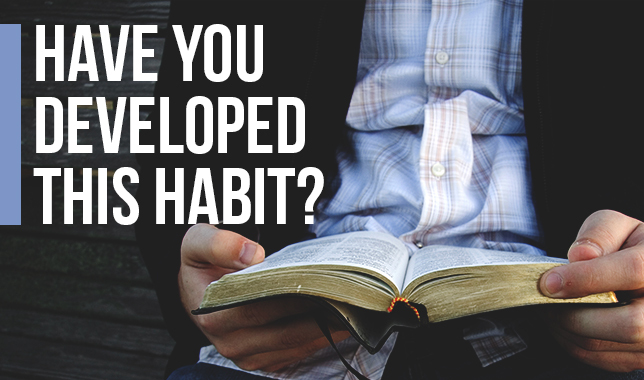 Have you developed this healthy habit yet? Start reading with us today, and encourage others to join in too! Where do you turn when you need wisdom? “If any of you lacks wisdom,” James 1:5 says, “let him ask God, who gives generously to all without reproach, and it will be given him” (ESV). What does the wisdom God gives look like? “Wisdom from above,” James 3:17 says, “is first pure, then peaceable, gentle, open to reason, full of mercy and good fruits, impartial and sincere” (ESV). Commit this verse to memory, and you’ll be able to better discern the wise thing to do! This Sunday, February 7, I will finish up the Sunday morning series of messages called, “Wisdom to Live By.” So, read through James chapter 5, bring your Bible, and invite a friend to join you for worship at Ingleside. I hope to see you Sunday! I’m very grateful for your partnership in the gospel, and count it a joy and privilege to be . . .